Much has been written about Nat Turner – most focus on him as a fierce rebelling slave or murderous, deranged fanatic. This full-length play shows him as something quite different – a thoughtful, multi-dimensional character longing for self-emancipation who sought inspiration from the scriptures. To turn history into this unique version of the slave rebel’s destiny, P. A. Wray turned to Thomas Gray’s The Confessions of Nat Turner to enter the mind of Turner, then she wove in local lore, African tradition and her own imagination. JEREMIAH COBB (VO): Nat Turner! Stand up. (Nat stands)Have you anything to say why the sentence of death should not be pronounced against you? NAT: I have not, I have made a full confession to Mr. Gray, and I have nothing more to say. JEREMIAH COBB (VO): Attend then to the sentence of the court. You have been arraigned and tried before this court, and convicted of one of the highest crimes in criminal code. Your only justification is that you were led away by fanaticism. If this be true I pity you, you have my deepest sympathies. I am nevertheless called upon to pass the sentence of the court, that you be taken hence from the jail from where you came, thence to the place of execution, and on Friday next, between the hours of 10 AM and 2 PM be hung by the neck until you are dead! dead! dead and may the Lord have mercy on your soul . . . your only hope must be in another world. Southern tree, Southern tree, Southern tree. . .
Southern tree, Southern tree, Southern tree. Now you stand tall and stay strong. Southern tree, listen to me! Let it be! NAT: What is this place? What is this darkness? Lord, where do you have me? Lord, this is your servant, Nat. Lord, can you hear me!? NAT: No! Wait! (pause) No! Don’t . . .
NAT: It’s light here. Light is supposed to make us see, but do we all see the same thing – the same way? What do you see when you look at me? What do I see when I look at myself? . . . (looking at his hands)) This is blood! This is their blood . . (as he tries to wipe his hands clean) Am I a madman? Am I evil? Am I a butcher – a murderer? (pauses for an answer, then continues)I’ve been called these things and more because of the events which occurred back – (motions to the dark area from where he came)there, in Southampton County, Virginia – in August,1831. There was a slave rebellion -and I, Nat Turner – was the leader. This video was filmed at Wayne Theatre in Waynesboro, Va. on Feb 1, 2019 by Ernest Lowery. Minerva – Great Mother. Video shows the last 10 minutes before Nat reaches home. The Venue on 35th presented the premiere production of Nat’s Last Struggle: Nat Turner Makes His Way Home, written by P. A. Wray. Directed by Venue Artist-in-Residence D.D. 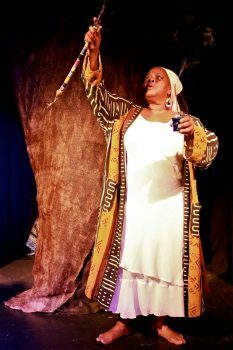 Delaney, starring Dijon Macintyre as Nat Turner, and featuring folk artist and musician Minerva as The Great Mother, Wray’s revision imagines Nat, not as a slave, but as an African prince at war with an oppressor. A man inspired by the Bible – who had to kill the serpent and find his way home!